This may well be my last update for two and a half weeks. I'm off on holiday on sunday, to the Maldives with my girlfriend. I'll be keeping a daily 'log' type thing all the time i'm there (on my palm) which will be posted as soon as i've got back. Some other bloke in the netherlands designed and built a working clock out of lego. Where do these people learn their trade? Is there an international lego builders university? Greg's web log is just brilliant. Read it all. The entire archive. That should give you something to do until I get back. Look at it. Just look at it. It's a Mac. At my desk. I know. It's not my fault. At least I've added some custom wallpaper (see below). It's a two player Connect 4 simulator for windows. It uses TCP/IP so works across the Internet as well as your office network. The current version is in english, but I've written it so that it can be translated very easily. It also includes a chat facility so you can talk to your opponent mid-game. As usual, there are a bunch of people to thank for beta-testing: Mark, Sally, Luke and Matt. Thanks people. Incidently, I have redisigned Matts site for him. Don't rush over there yet though, because he hasn't switched to the new layout yet. Watch this space. Console market hell is on the horizon as Nintendo as poised to launch their new console, the game cube (quick Apple - sue sue sue). Read about it as it happens here. The first screenshots look impressive, but so did the graphics on the N64 and look what happened to that. Menno (artbeast webmaster) believes it will cause significant discomfort to the PSX2. I disagree, but what do you think? Tell me. Only a few days left until my departure into the unknown. Recently a plane crashed just out of the airport at Bahraine. That's where our plane is stopping. I'll try my best not to die though. Has Peter been kidnapped or something? I haven't heard from him for over a week now. Since he's co-creating a new project with me, this isn't a good thing. Anyway, must get going. Bye. Not long left till I wont have Internet access, as bex keeps pointing out. Arrrrrgh. We went up to preston at the weekend to see her uni. Very nice, even if it did take 6 hours to get there. Damn damn damn. Went to Waterstone's in preston and spent too much money. At Mat W's small gathering last friday (how can one street have three houses called number one?) we once again saw Henry, Liz Gasden's bloke. He completely refuses to tell us his surname, but we've had some good guesses. We eventually came up with Henry "fish-head cat exon". If you think you can do better, then e-mail me. The best suggestions will get posted here at some point. Things to do today: Even though it's a bit too 'mainstream blog', visit benbrown. Go read a fluorescent blog then find out what's going on, uk style. Above all, smile smile smile. I've added a quote from Elly Collins to the front page (you might have to refresh a few times to get it). She was crying when she picked up her exam results. I didn't talk to her but I guess she didn't get what she wanted. It's a really good quote. It was a happy day for most. Bex got twice as many points as she needed to go to preston, Jen and Deb both got 4 A's so Jen's off to play with people's brains (or something) while Deb waits for next year to be a doctor. Jen and Katie both just missed their offers but got in anyway (yay!). Katie just missed hers but got in. Dave screwed up pretty bad, but he still gets to go to UCE with me and Katie (Wooooh). I stole Elly's quote (shamelessly) from henry's site which is now open for it's 3rd tenure. Quite a lot of my friends have web sites, though most of them are crap. Henry's is quite good though. Although they look crap, Luke's and Matt's sites are quite fun - Check out their web cam war. And if you're reading this chris g, where are those web cam pics you promised me? My soon-to-be holiday is really dawning on me now. Two weeks with NO INTERNET ACCESS. Arrrrrgh. How am I going to cope? The emails from terrania alone will be enormous. Things to do today: Try finding out your cyborg name, visit a graphically slick site, visit patti's blog, laugh at british comedy and post something on spampad. Message ends. Today's pics are of infamous 5e lurker Paul Tweedy, and myself. Wooooh. I really wish that there was some way of writing down conversations (acurately) that occured previously. When you talk about something over ICQ (like the conversation with warren), then you can acurately reproduce it later. The conversation I've just had with Paul Tweedy can't be reproduced to any degree of acuracy. Damn. I'll explain the basics though, in a quick summing-up. I got a cirular email from mp3.com formatted in HTML. Paul thinks that all email should be plain text - no formatting, no nothing. I think it should be allowed to be as multimedia as any other channel. If all mediums remained plain we'd have black and white TV, only pure speech on the radio, no pictures in books, no layout on the web etc. I don't see why email should have to be so constrained to one facet. He disagrees. I think his point of viewe comes from the stupid unix eliteisim thing. Beacuse unix only has a command prompt and no gui, he automatically thinks it's better. In many cases this is not true. He argues that he should be able to read all email on his palm or i-phone. In response, I suggested that he should be able to view all web pages on his phone as well, but he disagreed - apparently email is (read: should be) different to every other channel. I think he is being ignorant. What do you think? Tell me. I want te be an angle, thought it might be groovy, sort of a mixture between them out of city of angles and the angles from DOGMA, I like the wings. I wonder if he wants to be an acute angle or an obtuse angle? Surfing katie's site (a daily task), I found this site by Bronwyn. Very nice. She's good at what she does. As is the design girl. Blog-tastic. I went to crappy crappy crappy pc world and bought a game among other things. Unfortunately it doesn't want to run on my machine at work, though likes my home machine and my girlfriend's mahcine. It's okay, but not nearly as cool as settlers 4 which might be out before I die. Random link time: Have you been watching big brother? It doesn't matter, because you can make up your own series. For amusement, check out the dangers of DHMO. Want to win stuff? Try here. I've created a brand new site dedicated to my game. Check it out. I created an online colaboration tool called spam pad which is quite like metababy at the moment, but it wont be when I'm finished. My girlfriend's site now has it's proper URL. Hurrah for nominet. Following the trend, julie has created a personal site. Pretty cool so far. She's just left on holiday (a few hours previous) so don't expect any updates for a while. On the cartoon front, I discovered diesel sweeties. Extremely funny. As good as dilbert (but in a different way). Katie, my favourite blogger, has posted my scribble again. Check it out. And check out her site, it's great. Another blogish site worth checking out is waferbaby, though it's not nearly as good. Anyway, that's all for today. See you all later. Today I'm going to be a link whore - I've collected lost of stuff that I've just got to share. First up, I seemed to miss out on posting links to rubberburner and supergreg. Seems that the whole thing is part of a viral marketing campagin by Lee jeans (or, at least, by their ad agency Fallon). Well, it seems there was a third installment in this mahir inspired sequence. Not nearly as good as the first two, but amusing nether the less. Groovy design sites today are kiiroi, greyscale, assembler and re-move. Great stuff. Blog of the week is magnet box, a nice mix of typical blog type stuff. Nice. Loads of people have been talking about this dancing thing. Pretty cool, but not worth all the fuss imvho. You have permission to only be vaguely ammused by this imac inspired idea. Not nearly as good as the original. We don't want old people online - they'd hand around virtual post offcies smelling of virtual wee. If you're interested (like I am) in leviatationm then go here or here. I found these sites whilst reading the faq for alt.sci.physics, a brilliant newsgroup (obviously not as good as ark, but what is?). BML = BDBE Markup Language. BDBE = BML Database Engine. Ha - that would confuse all those unix users to death. My lovely girlfriend has started her own site which can be found here until the domain registration comes through. 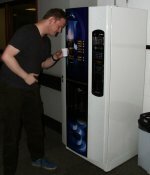 Behold our beloved coffee machine, dispenser of fine ExpressChoc (Paul not included). The nice? people here at Saturn Facilities have decided to move it far away from our office to the other side of the garden. Very funny. Not. Stupid news of the day is palm's plan to bring out a cool blue palm for the fall. The stupid thing is, they got claudia schiffer to endorse it and call it the Simply Schiffer. It will come bundled with software chosen by the airhead herself. As kibo has already pointed out: Why choose your own software when you can get a supermodel to choose for you. Indeed. Janice believe's it's a good idea because Simply rhymes with Schiffer. I disagree somewhat. I think you should all sneak a peek at magnesium, a community unix shell account project thingy. I can't explain very well but read their manifesto to understand what they're trying to do. Here we see blogging mastermind Paul working away at his new project, Blogism. More to come on that in the coming days, but it should prove to be quite cool. Some people are starting to take an intrest in terrania. This is a good thing. Do any of you have any good suggestions for features etc. ? I'd love to hear your comments/thoughts, either via email or in my forums. Everyone needs to go and vote on WAP in my new poll. I just want this graphics card. For more fun (and telesales workers. haha), Check out the all new 'smoker cam' on paul's site. If you have avantgo for your palm then you can get the i am cal channel. For those of you without avantgo, you can get the lite version of the news here. Check out my store where you can buy cool i am cal coffee consumption apperatus. The 'mat is evil' mouse mat will be available soon :::). Talking of mat, here's a groovy animated gif of his exploits with the water cooler. This zack guy is pretty cool. I like his minimalist design. Do you think that's through purpose or laziness? The former i would hope.